What Do We Know About Temren Missile? Temren means arrowhead in Turkish. 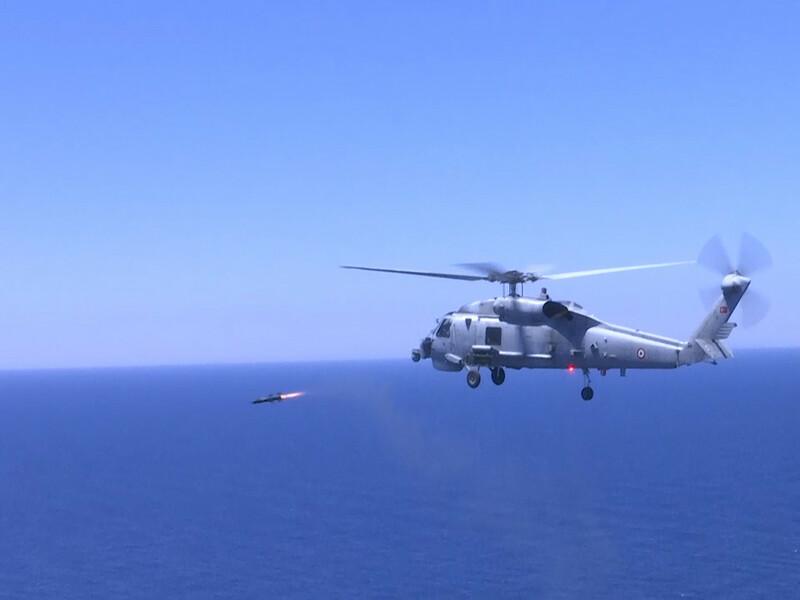 The missile is designed primarily to be used by naval helicopters against small surface targets. It is possible to adapt the missile to be used from small combatants in the future. The missile is a derivate of the long range anti-tank missile UMTAS developed by Roketsan. My understanding is that the request for Temren came for Turkish Navy and the project was initiated by them. The absence of publicly available information and the unusual lack of marketing documents and news releases from Roketsan’s side indicate that the project is managed also by Turkish Navy rather than Undersecreteriat For Defence industries (UDI). Since there is not much publicly available information the rest of the text is my based of on sparse information available on internet, on some gossips and on my opinion. UMTAS, with its Imaging Infrared Seeker and Laser Seeker options, is an anti-tank missile, having a range of 8 km and lock on before/after launch and “fire and forget/fire and update” properties, used against armored targets, from air to ground as well as ground to ground. UMTAS, with its maximum range of 8 km and minimum range of 500 m is capable of operating all weather conditions and day/night. UMTAS has a RF Data Link that enables missile to receive target updates after firing. As stated, Temren is a UMTAS modified for maritime operations. Thus, it should have an IIR seeker to improve its aim. 8 kilometers is a good range for an airborne anti-tank missile and makes UMTAS on par with Hellfire. Traditionally, naval vessels have a better defence against aircraft compared to tanks. For naval engagements, a 8-kilometer-range, is not enough as it will put the firing helicopter well inside the effective reach of MANPADS and light anti-aircraft missiles like RAM. Temren should have longer range than the stated range of UMTAS, to give Temren a true stand-off radius. A longer range for Temren can be achieved either by making missile larger to place the extra propellant or making the missile lighter by making the warhead simpler or smaller. A tandem warhead designed against armored vehicles may be an overkill for naval targets. Thus, Temren might have just a HE warhead that weighs less than the original. The first test firing was performed in January 2015. So the developent of the missile must have been started somewhere in 2013 -2014. A Temren was also fired during the recent Deniz Kurdu 2017 naval exercise last month. The missile has the potential to be fitted on smaller surface vessels. It is safe to assume that work is also being performed to integrate the Temren with stabilised weapon systems on naval vessels, giving them a stronger punch. One Response to What Do We Know About Temren Missile? THE TEMREN MISSILE THE NEW ANTI-SHIP MISSILE FOR THE TURKISH NAVY.